Hi There! Happy Hump Day to all my lovelies! Today I want to talk to you about the style of the day featuring faux fur vest. As you know, faux fur is the current trend of the season and you will find it everywhere. However, I don’t know if told you this before, I am not much of a trend follower. Growing up, I always liked to stand out in the crowd. I fell in love in faux fur back in the early 2000s when faux fur wasn’t a big trend. I used to wear it as a teenager everywhere and liked standing out in the crowd. I love the chic look it creates and the warmth I get from it as well. Additionally, do doesn’t like the glamorous look created by faux fur style? The Faux Far Jacket: I absolutely love this Jacket. I got it from Ann Taylor Loft back in 2006/2007 and fell in love. The quality of the faux fur is amazing. I am always pleased with my purchase from the Loft. There is nothing similar to this available at the Loft, but you can get this Collared Faux Fur Vest from Inc, which is available at Macy’s on sale for $73.99. Like the Loft version, this vest also has a zipper closure and looks beautiful. The Baby Soft Sweater: I loved pairing my vest with my favorite baby soft crewneck sweater from French Connection. I got mine from Gilt. You can get the same sweater in Roxy Kiss color from Asos. It’s currently on sale for $55. One thing that I love so much about this sweater is that it’s really soft. The faux leather pant: I love my faux leather coated slim pant from NYDJ. It’s very soft and huggable and worth every penny. Wear yours with your favorite pair. 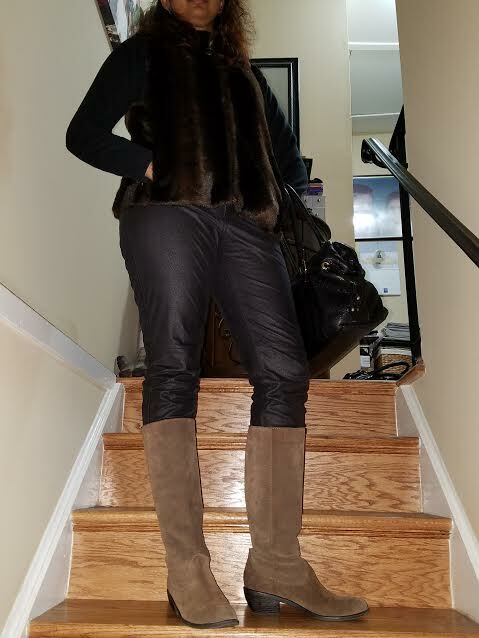 I also love my Eva Longoria Faux Leather Pants (on sale for $49 at the Limited). l love how breathable and stretchable it is. Most of all, it looks amazing. I am so glad that I did because this beautiful item is currently sold out. You can get a more affordable version at Forever 21 for only $24.50. I actually like the NYDJ version available at Bloomingdales on sale for $110.68. The Boot: In winter, no style is complete without the perfect pair of boots. I got my boots ages ago from DSW. They go great with the dress. I just love my tan suede boots. The tan boot combines comfort and style together and completes the look of this stylish and chic outfit. What is your favorite outfit to wear during the winter? I hope you enjoyed this post as much as I love writing it. Don’t forget to check out my Facebook Page and follow me on Instagram @allaboutme3181. This entry was posted in Fashion, Style, Uncategorized and tagged Asos, blog, Blogger, Chic Fashion, DSW, Fashion, Fashion blog, Fashion trend, Faux Fur, Faux Fur Leather, Faux Fur Vest, French Connection, Inc, Lifestyle, NYDJ, Style of The Day, The Boots, The Limited by allaboutme31. Bookmark the permalink.